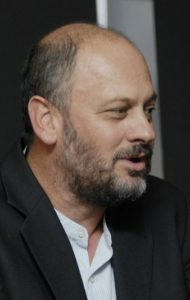 Tim Flannery (b.1956) is Professorial Fellow at the University of Melbourne Sustainable Society Institute, and Chief Councillor of Australia’s independent Climate Council, launched in 2013 after the Australian government disbanded the Climate Commission, where Flannery was Chief Commissioner. Flannery has authored more than 25 books on climate change and environmental concerns, including The Weather Makers: The History and Future Impact of Climate Change (2005, a New York Times bestseller), Now or Never: Why We Need to Act Now for a Sustainable Future (2009), Here on Earth (2010), and Atmosphere of Hope: Searching for Solutions to the Climate Crisis (2015). He was awarded as the Australian of the Year in 2007. He is also Chair of the Copenhagen Climate Council, a global collaboration between business and science began in 2007.